Isathal (Fucithalmic) There is 1 product. Fucithalmic Eye Drops contain the ingredient Fusidic Acid and belongs to a group of medicines called anti-infectives. Fucithalmic is a type of antibiotic. Fucithalmic works by killing germs (bacteria) that cause infections. 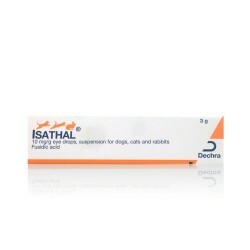 Fucithalmic is an eye drop medicine used to treat infections of the eyes caused by germs (bacterial conjunctivitis). Fucithalmic prevents the bacteria from producing proteins that are essential to them. Without these proteins the bacteria cannot grow, replicate and increase in numbers. Fucithalmic therefore stops the spread of infection and remaining bacteria are killed by the body's immune system or eventually die.